Many new mothers quickly discover the essential importance of having a baby swing for their infant. This soothing baby product offers comforting movement for the little one, while allowing Mom some hands-free time or just a moment to relax. Currently, there are quite a few options for baby swings on the market, including different toy and entertainment choices, folding and transportable models, swinging and movement settings, and more. 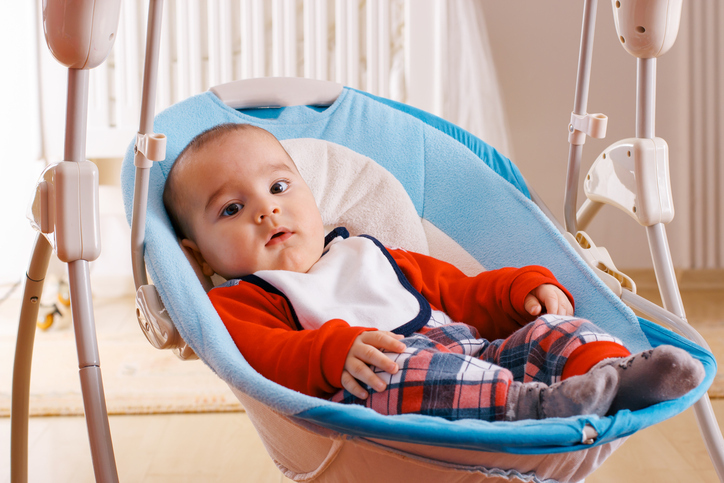 When it comes time for new moms and dads - or other family members - to pick out a swing for baby, there are several different things to consider, but one of the most critical factors to think about is safety. While most babies love time in their swings, it's important to look for safety capabilities and keep in mind certain usage tips to keep your little one soothed and secure. • A wide, sturdy base: The Consumer Product Safety Commission updated its mandated safety standards for infant swings, requiring manufacturers to complete a stability test to ensure swings won't tip over or unintentionally fold during use. It's also important for shoppers to look for a wide, sturdy base when selecting a baby swing, and be sure to place the swing in an area where the base or legs won't trip people. • Safety harness: A harness ensures that even while the swing is in motion, or if baby shifts slightly, she will remain secure in her seat. The harness should always be used when baby is in the swing, even if you're not using the swinging or motion features. • Reclining seat: As the American Academy of Pediatrics recommends, it's important to select a swing that includes a reclining seat to ensure the infant's head is supported. If your child is younger than 4 months old, use the most reclined seat position to prevent her head from slumping over onto her chest. • Weight limit: Parents and caregivers should always observe the swing's weight limit to ensure proper use and safety. • Toys and mobiles: Entertaining elements like toys hanging from mobiles or connected to the swing should be completely attached and not easily removed. These can become a hazard to baby if she is able to detach them. In addition, parents should avoid selecting a swing that includes light projectors, as these can overstimulate infants while using the swing. • Never leave baby unattended. Many parents love their baby swings because it allows them some hands-free time for chores and other activities. It's important, though, that while baby is in her swing, she is never left by herself. Keep baby within your sight at all times. • Start slow with motion settings. Most swings have several different speed or motion settings. It's important to start with the lowest setting, especially for very young infants. Swinging too fast or too roughly can overstimulate or upset baby. It's also important not to push the swing, and instead let the swing itself do the work. • Avoid elevated surfaces. Even smaller, portable swings should be placed on the floor, and not on a table, counter or other high surface to ensure that the swing doesn't tip. • Limit swinging time. Experts recommend that babies don't swing for longer than 30 minutes, as it can make some infants dizzy. It's important that swings are turned off if parents or caregivers are drowsy. • Prevent sleeping in the swing. Pediatric sleep consultant Amy Lange noted that swings shouldn't be treated as sleeping environments, as the sleep babies get in their swings isn't as beneficial as sleep in a stationary spot, like the crib. If your baby does begin to fall asleep in her swing, carefully move her to the crib, and rub her back until she falls asleep again. • Know when to stop using. A cradle swing should not be used once baby can roll over, or push herself up on her hands and knees. A traditional swing shouldn't be used if baby attempts to climb out.